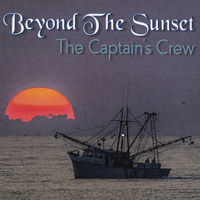 The Captain’s Crew has released their first CD in six years, “Beyond the Sunset”. The Crew is joined once again by a number of their friends, who share their musical talent giving each song a unique melody that will keep you listening from the first track to the last, which happens to be a Christmas song bonus track called, “Christmas Bells”. The CD was recorded and mixed in the “Life Saving Station” studio, in Wanchese, NC. The Captain’s Crew is Jack Cahoon on bass and vocals; Will Fields on guitar and vocals; Connie Francis on vocals; Eddie Francis on guitar and vocals; Bill Rea on mandolin, dobro and vocals; Roy Riddick,on drums and vocals; Ken Mann on piano, guitar and banjo. The 13 songs on the album include 5 original songs and new arrangements of 8 old favorites. The CD begins with “There’s an Anchor in the Boat written by Eddie Francis. Former Warner Brothers recording artist, Roy Murray, plays flute and piccolo to give the song the sound of an old-time sea shanty. Murray arranged and played trumpet and cornet on a number of other songs on the CD including the title track, “Beyond the Sunset”. This classic, with Roy Riddick singing the lead, has a new rhythm with bongos and trumpets giving the song a real calypso flavor. David Johnson, one of North Carolina’s great studio musicians, who has played on most all of the Crews previous CDs, comes together with former band member Rocky Creef, who returned to play what some say is the best old time church piano in the Tar Heel State. Johnson’s fiddles complement Creef’s piano, like a hand in a glove, on two Will Fields songs, the Jimmy Davis pinned “What Heaven Means to Me” and, “He is my Everything”. Johnson can also be heard on steel guitar, mandolin, banjo and dobro, filling in behind the members of the band throughout the album. One of the many special songs in the collection is, “A Friend Called Jesus”. The soft and sweet drums that set the tempo, were played by the late Martin Parker and were recorded shortly before his death. The Edenton native also, played on most of the past records of the Crew. He was best known for his award-winning performances with artists like Patty Loveless, Ricky Skaggs and Vince Gill. Katelyn Rae joins her father, Bill, for a stirring rendition of the Hank Williams Sr. favorite, “House of Gold”, Her powerful delivery will keep you hanging on each word, giving the listener reason to stop and reflect on the story Hank was telling when he wrote the song many years ago. Bill also sings lead on a soulful rendition of “People Get Ready”. Jack Cahoon plays a perfect bass to this timeless gospel number, as well as giving a solid bottom to the remaining tunes for the other musicians to play with. Connie Francis’ background vocals and lead vocal on the standard, “It is No Secret”, are a perfect blend with each song. Her many years of experience and love for the music is evident with every note she sings. The melodies of three of the songs will sound very familiar. “He is My Everything” is sung to the tune of the big Jack Green hit, “There Goes My Everything”. Before his death, Green and song writer Dallas Frazier rewrote the words to reflect their faith. It is this new gospel version of the song you will hear on the CD. “I’m Stepping In” is a remake of the Johnny Cash song, “Folsom Prison Revival”, but the lead guitar was setup to sound like Waylon Jennings so it is a real toe tapper. It just so happens the words to “Amazing Grace” fit perfectly with music in the verses, of the Eagles, “Peaceful, Easy Feeling”, so the group combined the two songs. Those who grew up in the 70s will find themselves singing this musical mix over and over again. The last song on the CD is called “Christmas Bells”. Mann, also the producer of the album, said it may seem odd to include one Christmas song on a CD, especially this time of year, but remembers when James Taylor did it on his, “October Road”, album, when he included, “Have Yourself a Merry Little Christmas”. Mann added “Eddie Francis wrote such a great song and the live performance of strings and horns sounded so beautiful, we simply could not wait to share it with everyone. Now you can be in the Christmas spirit all year long”. The Captain’s Crew has played together for well over fifteen years at fairs, festivals and churches, including The North Carolina State Fair, The Midnight Jamboree, The Nashville Cowboy Church, Merle Fest and Singing on the Mountain. The band has appeared with such notable artists as The Dixie Melody Boys, The Laymen, John Anderson, Ricky Van Shelton, The Kingston Trio, Ronnie McDowell, The Chairman of the Board, the late George Hamilton IV, The Anchormen, Just Inspired, Undivided, Michael Combs, The Greenes and Wanda Jackson. The Captain’s Crew sang to a nationwide TV audience when they appeared on the television special, “An Outer Banks Christmas” and the "George Hamilton" special on the UNC TV Network hosted by band member Ken Mann on, “My Heart Will Always Be in Carolina”. Two of their five previous albums were listed for eligibility for Grammy consideration and their songs can be heard on radio stations around the world including XM Satellite Radio. It is yet to be determined what the first single release to radio stations will be, but no doubt it will join the many other records the Crew has charted in past years. Although all of their songs are gospel, their diverse sound has resulted in their music being played by radio stations featuring various formats of music from around the world. The single, “Don’t Let the Devil Dance” was number one on the Texas Swing charts, while “We Will Meet Again” reached number one on both the Radio Active Country and Southern Gospel Charts, and the single, “There’s a New Kid in Town” reached the top ten, on the Independent European charts.